With one of the largest uninsured populations in the country, North Carolina is home to far too many people who lack the regular health car access and financial security that comprehensive health care coverage provides. In an economic landscape in which employers consider health outcomes in their location and expansion decisions, North Carolina’s 10.7 percent uninsured rate—the 10th highest in the nation—makes us less competitive. Moreover, it limits the ability of our residents to thrive. After all, having health insurance improves the health and economic security of individuals and communities. When people have coverage, they are more likely to have a source of regular health care, get the quality care they need, and report better health outcomes. When uninsured people gain coverage, they are less likely to face high out-of-pocket costs and less likely to incur medical debt, giving them a better shot at prospering in today’s economy. In this report, we use the Census Bureau’s American Community Survey data to provide an updated profile of the uninsured in North Carolina. The uninsured include men and women of all ages and backgrounds in all parts of the state. Many of these individuals work in critical industries like construction and food service, and for small businesses that don’t offer health coverage to their employees. Hundreds of thousands of these uninsured North Carolinians are stuck in a coverage gap because they don’t qualify for Medicaid under North Carolina’s current eligibility rules, but they earn too little to qualify for subsidies to afford their own private plan. By adopting Medicaid expansion, North Carolina can vastly reduce the uninsured population, thereby putting more money into the pockets of North Carolina households and improving health outcomes in our communities. To qualify for Medicaid today, a North Carolinian must both earn a limited income and fall into one of several narrow eligibility groups (shown in Figure 1 below). Because North Carolina Medicaid uses this restrictive eligibility, only some nonelderly adults with limited means can qualify. 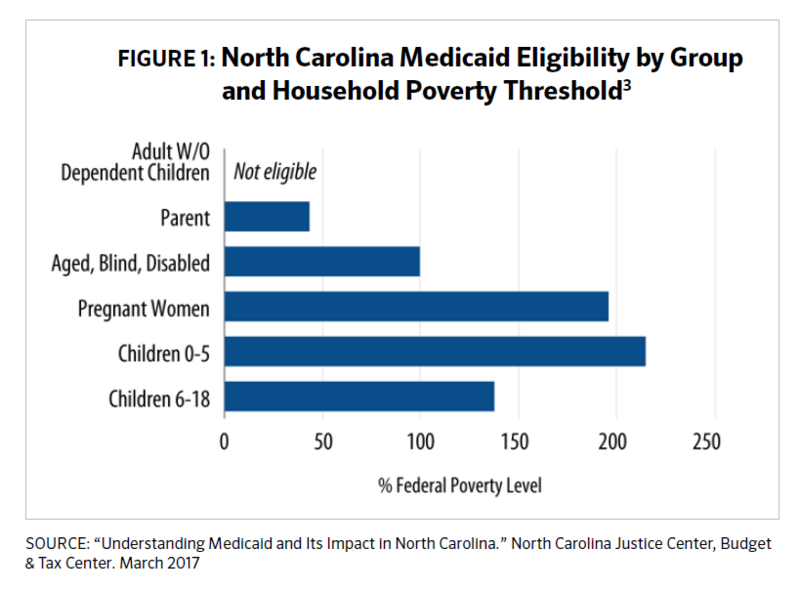 Whereas Medicaid covers roughly two in five North Carolina children, Medicaid is only available to adults in our state who are elderly, blind, pregnant, living with a Social Security-certified disability, or living with dependent children. While Medicaid does provide time-limited coverage to pregnant women, the scope of coverage is “limited to treatment for conditions that affect the pregnancy.” That means that pregnant women may not be able to get coverage for all necessary care unrelated to the pregnancy through Medicaid for Pregnant Women. Moreover, a better way to invest in maternal and child health is to ensure that women of reproductive age can access health care before they become pregnant—currently, 15.9 percent of adult women of reproductive age are uninsured in our state—and that mothers stay covered after delivery, as Medicaid for Pregnant Women only lasts until 60 days post-partum. Thus, for nonelderly adults to qualify for full Medicaid in North Carolina, they must either have a qualifying disability or dependent children in the house. Even then, the income eligibility threshold for parents—$8,004/year for a family of three, which is less than half of the poverty line—is so low that many uninsured parents in poverty cannot qualify. For all other adults, Medicaid coverage is unavailable regardless of how low their incomes are. As a result, hundreds of thousands of North Carolinians living in and near poverty cannot qualify for health coverage through Medicaid and instead go uninsured. As of January 2019, Medicaid covered 294,878 enrollees based on a qualifying disability. However, not all nonelderly North Carolinians who have a disability and limited incomes can qualify for Medicaid, and there is a significant population of uninsured North Carolinians living with disabilities. There are several reasons why some people with disabilities near poverty may be uninsured and uncovered by Medicaid in our state: (1) not all people with disabilities or chronic illnesses meet the strict Supplemental Security Income disability standard used by Medicaid; (2) the income eligibility threshold for this category is set at 100 percent of the Federal Poverty Level (FPL); and (3) Medicaid requires otherwise eligible people with disabilities to meet an asset test, so a modest life insurance policy or savings account can disqualify them. After Michigan expanded Medicaid, it found that 23 and 20 percent of expansion enrollees had functional impairments related to a physical disability or a mental disability, respectively. While estimates suggest North Carolina saw health coverage gains of roughly 509,000 since the implementation of the Affordable Care Act, the state’s progress in reducing its uninsured population and uninsured rate has lagged behind other states that have expanded Medicaid. By moving Medicaid eligibility up to 138 percent of the federal poverty level for people ages 19 to 64, North Carolina can drastically reduce its uninsured rate and cover hundreds of thousands of people in need of quality health coverage. This would create a more comprehensive health care coverage system for North Carolinians, thereby improving the well-being of our state. New data from the American Community Survey give us a very rough estimate of the uninsured in North Carolina who may benefit from Medicaid expansion. Nearly one out of every three North Carolinians ages 19-64 with income below 138 percent of the poverty line was uninsured in 2017, amounting to a total of 391,635 uninsured nonelderly adults with low incomes. This figure includes those who may already be eligible for some form of health insurance but not enrolled, as well as some populations who may not be eligible for Medicaid expansion. On the other hand, it does not capture those underinsured adults who will gain access to more affordable, comprehensive coverage under Medicaid, or the eligible but unenrolled children who will gain coverage when their parents become eligible for Medicaid. All in all, this figure illustrates a significant problem that our state leaders must solve. According to latest survey data, an estimated 1,075,983 people—10.7 percent of the population—in our state were uninsured in 2017. Like the rest of the country, North Carolina’s children and seniors enjoy higher rates of coverage due largely to public coverage available through Medicaid and Medicare for those populations. The vast majority—88.3 percent—of the state’s uninsured population is made up of nonelderly adults (people ages 19 to 64). The nonelderly adult uninsured rate is 15.8 percent, three points higher than the national average (Figure 4). Over one-third of the uninsured are young adults aged 19-34, roughly one-fifth are between 35 and 44, and another 30 percent are between the ages of 45 and 64. While a majority of the uninsured population is male, many women in our state lack coverage, including nearly 280,000 adult women of reproductive age (19-44). Among all nonelderly adults with disabilities in North Carolina, 14.5 percent—98,200 people—are uninsured. While Medicaid and Medicare both provide coverage to some North Carolinians with qualifying disabilities, many fall through the cracks of this patchwork system for reasons described on page 4. The racial demographics of the uninsured mirror the demographics of the state’s overall population in some ways: 68.9 percent of the state’s population is white, compared to 61.7 percent of the uninsured, while 21.4 percent of the population is Black or African-American (compared to 21.9 percent of the uninsured). When accounting for ethnicity, some of these dynamics change: while Latinx North Carolinians account for 9.4 percent of the state population, they make up 26.5 percent of the uninsured. When comparing uninsured rates within racial and ethnic groups to one another, racial and ethnic disparities become more evident. Among White North Carolinians, the uninsured rate is 9.6 percent; among Black/African-American North Carolinians, 11.0 percent; and among Latinx North Carolinians of any race, the uninsured rate is 30.3 percent. Today’s disparities in health insurance coverage result from years of policies and systems that have unequally distributed opportunities for gainful employment, limited access to jobs that offer health benefits, and unequally provided access to health care services and facilities, among other factors. The ethnic disparities in coverage also reflect the fact that North Carolina’s non-citizen population is disproportionately Latinx,and non-citizens face stricter eligibility rules for programs like Medicaid. In fact, undocumented immigrants cannot qualify for Medicaid at all due to their status. 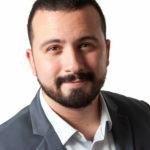 While eligibility for the Marketplace allows a broader spectrum of non-citizens to participate, the vast majority of undocumented immigrants are also ineligible for Marketplace participation. 40.5 percent. 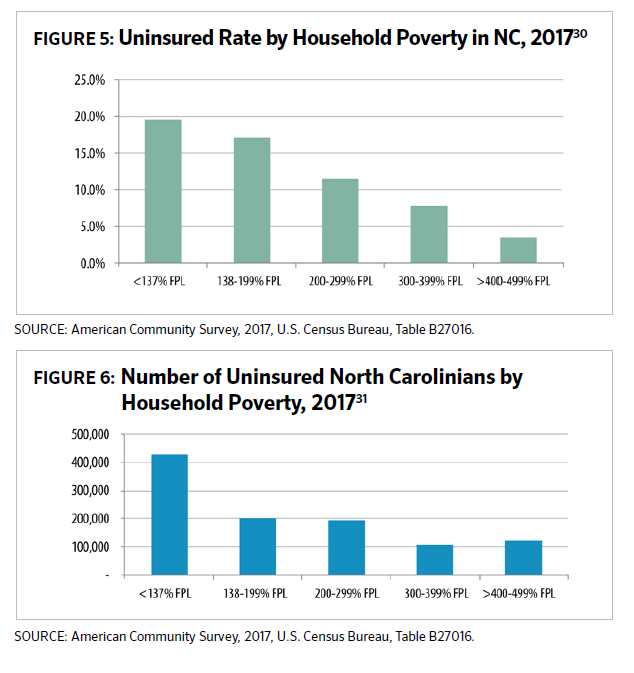 As demonstrated in Figure 5, uninsured rates are much higher among North Carolinians with lower incomes than among their higher-income neighbors. Also among the uninsured in North Carolina are veterans and their family members. An estimated 30,000 North Carolina military veterans and 23,000 veteran family members have no health insurance. Many veterans lack access to health care at a VA clinic due to inaccessibility, ineligibility, or other factors, and only those in active duty and veterans who retire after an entire career qualify for military insurance known as TriCare. As a result, tens of thousands of North Carolinians who served our country wind up uninsured and ineligible for coverage. Among these uninsured veterans, an estimated 12,000 currently fall in the coverage gap and would become eligible for coverage if North Carolina expanded Medicaid. The vast majority—86 percent—of the nonelderly uninsured in our state belong to working families. Over 600,000 North Carolinian adults are employed yet uninsured. Of those not in working families, national data finds that many are not working due to caregiving work, which is often unpaid (see Figure 7). 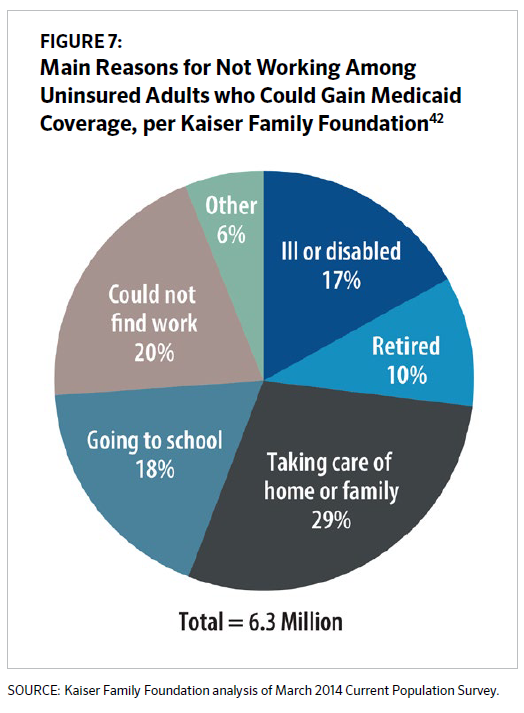 Other uninsured North Carolinians not in working families are living with a chronic illness or disability, attending school, or retired, or simply having trouble finding work in their community. Many workers do not have coverage through their employer because large employers aren’t required to provide health benefits to seasonal, part-time, and temporary workers, and because small business workers and entrepreneurs rarely have access to job-related health coverage. Under federal law, most large businesses must offer health insurance to their full-time employees. While nearly three out of every four uninsured nonelderly adults worked in 2017, nearly one in two of those workers worked either less than year-round or less than full-time. Employers commonly do not offer coverage to part-time, seasonal, or temporary workers. However, 11.5 percent of nonelderly adult North Carolinians who did work full-time, year-round in 2017 were still uninsured. Compared to other states, fewer North Carolinian workers are employed by companies that offer health insurance. Of workers in our state, only 79.1 percent work for an establishment that offers health coverage to some of its employees, which is the 8th lowest rate in the nation. Unlike large businesses, small establishments are not required to provide coverage to their employees. When considering only establishments with fewer than 50 employees, only 33.6 percent of small business employees have an employer that offers coverage, the third lowest rate in the nation and nearly 15 points below the national average. Additionally, 9.5 percent of North Carolina’s workforce consists of self-employed workers, but they account for 14.9 percent of uninsured workers. In order to get health insurance, entrepreneurs must directly purchase coverage on the individual market, or seek coverage through a public program or a family member’s job-based coverage if applicable. If their incomes are too low, they may not be able to qualify for premium tax credits to purchase a private plan. Given that the mean household income for self-employed North Carolinians is $30,068—less than half of the mean household income of their peers with traditional salaries and wages—the self-employed are more likely to fall into the coverage gap in our state. The self-employed make up a significant portion of the North Carolina workforce in several industries (as demonstrated in Figure 8 below). Despite the national economic expansion, the labor market is not delivering enough high-quality jobs in North Carolina, and even the existing jobs are not distributed evenly across the state. The vast majority of the state’s job growth is concentrated in just three urban counties—Wake, Durham, and Mecklenburg—and in 87 out of 100 counties across the state there are more jobless workers than there are job openings. connections to the labor force, and boosting local economies. North Carolina has the 10th highest uninsured rate in the country, limiting the potential of our state and communities to thrive. The latest Census Bureau data indicate that the uninsured in our state include many include workers, veterans, and people with disabilities, among others. Because uninsured North Carolinians are disproportionately nonelderly adults with low incomes, expanding Medicaid eligibility to 138 percent of the poverty line would allow North Carolina to vastly reduce its uninsured rate. By closing the coverage gap, North Carolina stands to reap the broad-based benefits of higher health care coverage rates, healthier populations, and stronger communities.